Establish a bed of coals by stacking bricks in a teepee formation. Place newspaper and/or kindling beneath the bricks as shown below. Ignite. Stack bricks flat and tight in stove. Place a brick teepee (see starting a fire) in direct contact with flat tight bricks. Do not stack near glass or on top of stove. Do not overfill! Ignite. Once you have a bed of coals, gradually add bricks as needed for desired heat and flame; just like fire wood. GrenHeat bricks contain no additives, and are safe for campfire cooking. GrenHeat Bricks are wood and may be used like firewood. they start easily if stacked with airspace between the bricks or in a “teepee” around a few wads of newspaper. The heat form the newspaper gets trapped in the top of the “teepee” to ignite the wood; within a few minutes all the bricks are started from the inside. Add more GrenHeat Bricks as with firewood. 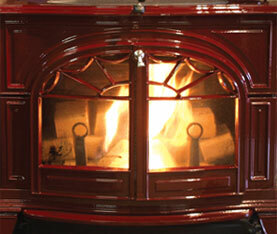 It will be very difficult to light only one brick in your fireplace or stove without any additional wood or paper. How Long Do GrenHeat Bricks Burn? As with any wood, burn time depends on how much air the fire is given. 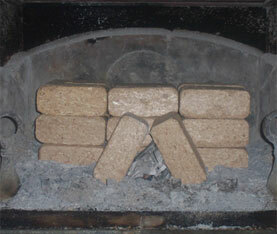 In an open fireplace, GrenHeat Bricks will burn for about 2 hours. In a well-stocked, damped-down wood stove (but not stuffed to capacity!) they will burn all night. You’ll want to experiment. How Much Heat Is Generated By GrenHeat? Like all wood, they give off about 8600 BTU’s per pound. Since GrenHeat Bricks are generally dryer than cord wood, less heat is lost to the vaporization of moisture. One ton of bricks contains about 17 million BTU’s. With heating oil, you’ll need about 140 gallons to get the same amount of heat; with propane, about 185 gallons; with natural gas, about 165 CCF or about 4980 KWh of electricity. Of course applicance efficiency will effect the amount of heat you get out of any fuel. Wood bricks are an extremely dry, 100% wood product. Use only in a well maintained stove or fireplace. GrenHeat bricks expand slightly when burned. Do not stack near glass or on top of stove. How Are GrenHeat Bricks Made? They are held together by the force applied to them during the manufacturing process. Wood fiber is fed into a mold, where a large ram puts thousands of pounds of pressure on the fiber and compresses it into a GrenHeat Brick. The bricks are held together by the rejoined fibers in the wood and the natural resins. No glues or binders are added. Although split wood is often bought by the cord, there’s no good way to know exactly how much wood you’re getting since a cord is defined by the 8’ x 4’ x 4’ dimensions of the stack but not by how densely it’s packed. The heat value of wood is determined by the weight and dryness, and since GrenHeat Bricks are sold by weight, you can be sure that you’re getting one ton of wood. 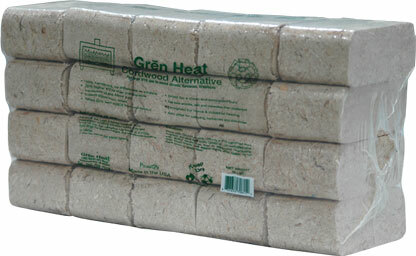 GrenHeat Bricks are wrapped 20 bricks per bundle and each pallet is wrapped and covered. They take up half the space of cordwood, are clean, have no bugs and are easy to stack and store. 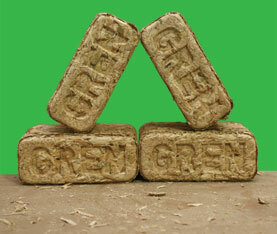 GrenHeat Bricks are made from recycled waste wood that might otherwise have gone to the landfill. We use premium hardwood shavings, wood chips, and sawdust. the use of GrenHeat Bricks helps to reduce the environmental damage resulting from production and burning of fossil fuels.